Ok, so my family’s Christmas is not quite like this but my extended family has always thought this song was funny (along with at least 3 viewings of A Christmas Story, complete with everyone saying the lines to the movie). My side of the family (the Bryant/Jeffries side) has quite the sense of humor and never take ourselves too seriously. I can’t say the same thing for the Pollock side. No bean dip or margaritas, there, but they always serve really high end wine, which has its advantages, too. I have, actually, run to the Quickpak store on Christmas Day, which is kind of a depressing place, for some Diet Coke. Over 23 years, Mike and I have melded our Christmas traditions and now do a combination of Merry Christmas from the Family and a stodgy version of O, Holy Night. What does this have to do with running? Not much. It is just the holiday season. I took some time off from blogging and “serious” running after the marathon. I was tired, y’all. Really tired. 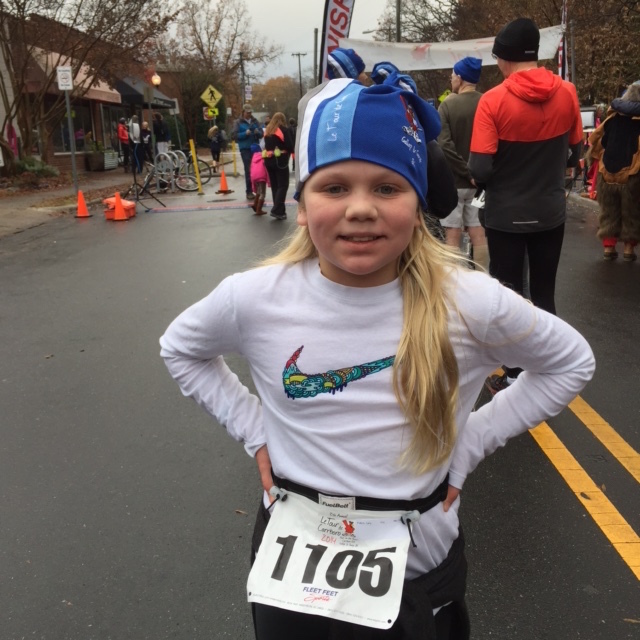 I “ran” 4 days after I finished the marathon on Thanksgiving Day. Carly ran it with me and we had fun. I still ran three days per week since then but just whatever I felt like. I slept in on a couple of Saturdays. It was nice, but I missed my Best Running Friends so I started getting up at 5 AM, again, on Thursdays to run campus and at 6:30 on Saturdays to run with the crew. On Thursday’s run this week, running started to feel good, again, for the first time since the marathon and I felt like I could keep going. We had a beautiful snowy run this morning. Sissy is planning a fun Christmas Eve morning run for us from her house with warm cinnamon buns afterwards. I can hardly wait! The purpose of my running since Thanksgiving has been to outrun my holiday eating but it is not working. The scale is telling me to lay off the wine and the rich food! I’ve planned out my 2015 racing schedule and it is already full. I’m sure I will fit some more races in even though I know I should not. Carly and I are tackling the Star Wars races in Disneyland. I can hardly wait. I am mentoring the full marathon group with Fleet Feet in January. 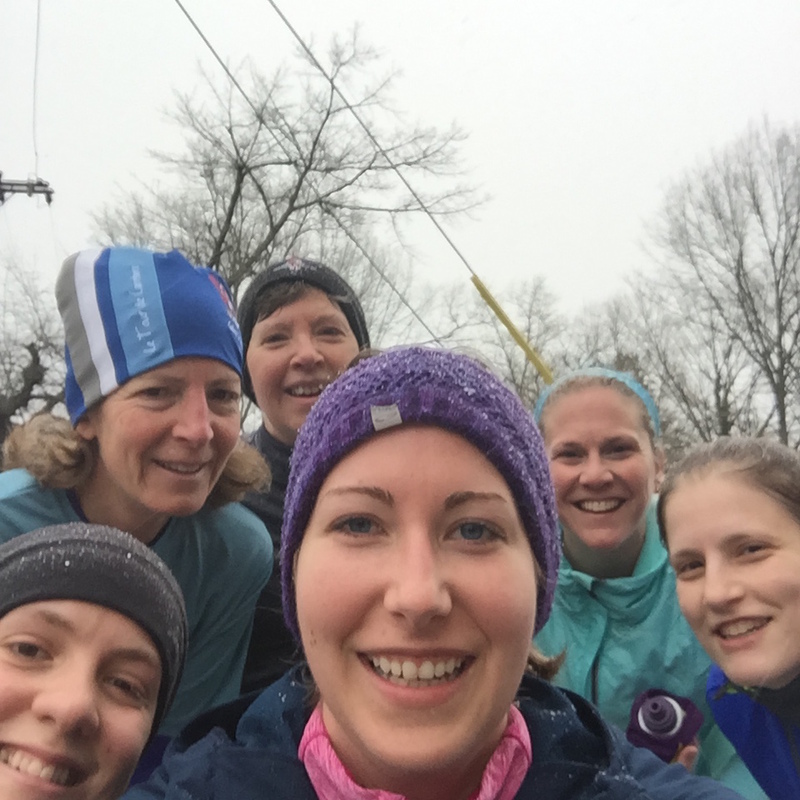 I have no intention of running a spring marathon (saving that for fall) but it is hard for Nora to find slow people to mentor the fulls and I am no longer scared of the long run. In fact, I now crave them. I am addicted so I will run with the slow folks up into the double digits. I will blog, occasionally. I think about 4 people will read it but that is OK. In the meantime, happy running and Merry Christmas from the family!